Established in the York area more than three decades ago, with a vastly experienced team we are able to provide a highly professional standard of service in many areas of the motor industry. 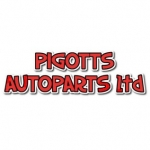 Supplying quality used car spares to trade and public alike. We also offer a next day mail order service for any parts large or small.